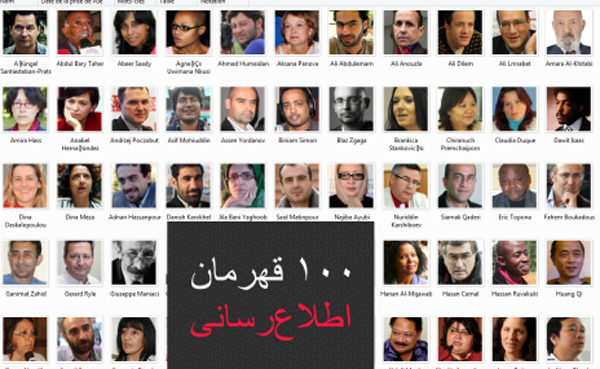 On the coming of May 3rd International Press Freedom Day , Reporters Sans Frontier Named 100 Hero Reporters ! Jila Baniyaqoub, Said Malekpour , Siamak Ghaderi and Adnan Hassanpour. A Film during the first family visit to prison after the assault on prisoners in ward 350 of Evin prison, Family members chanted : " Political Prisoners Must be Freed "
65 Iranian Political Prisoners From "Rejaei Shahr" Prison: Lets Pray for Iran and Iranian People ! 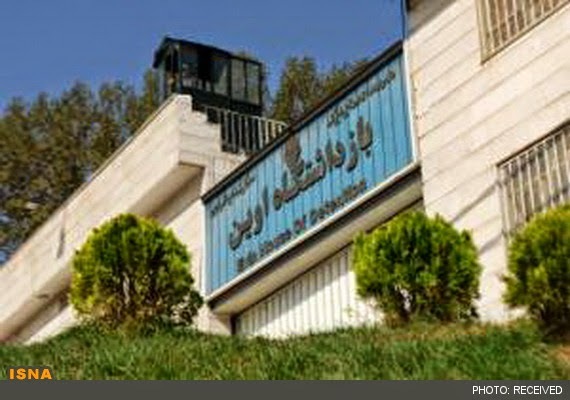 65 Iranian political prisoners of Rejaei Shahr prison : All of us have heard the situation of the prisoners from ward 350 in Evin prison, and disturbed . What had happened to this land and to its people? Why instead of kindness and friendship what we can see is the anger and violence and instead of tolerance and calmness what we see is the furious and rage ? Lets pray, so that lies ,Anger, violence , hatreds will be replaced by honesty , kindness and tolerance. Lets pray in solitude , with our families , neighbors and countrymen. It is not important in what compass /direction or in what language we pray, but lets pray honestly and whole heartedly. Lets pray together and for each other. Pray for Iran and Iranian people , pray for fruitfulness of new hope for new life, Lets pray for Iran . 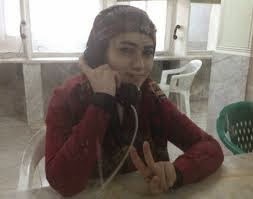 Maryam Shafi’ Pour, a prisoner of conscience, has been sentenced to seven years in prison on charges apparently related to her peaceful activism. She has lodged an appeal and is awaiting the Appeal Court’s decision. and is awaiting the Appeal Court’s decision. her interrogation that unless she made a “confession” her prison sentence would be more than five years. transferred to the prison’s general ward. skin rashes for which she has not yet received treatment.  Calling on them to overturn the ban on pursuing university studies imposed on Maryam Shafi’ Pour. An Iranian Lawyer : Public Prosecutor as judicial executive must interfare in to the Assault on political prisoners case ! Mr. Houshang Pourbabaei an Iranian lawyer speaking with ISNA news agency said: Public Prosecutor of the Islamic Republic must enter into the assault on political prisoners case , so that if the prisoners had committed a crime or if the prison guards have committed the crime will face the prosecution. 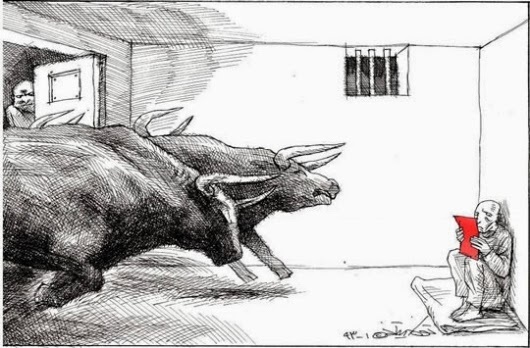 The rights of Prisoners are guaranteed in the rules and regulations of prisons. The law makers are trying to reduce the benefits such as TV, newspapers, books , Radio , Internet , visitation rights, health & safety or....other services inside the prisons. The prison officials and personnel must deal with prisoners based on by-law or law and regulations. The prison officials or personnel must not use bad words , punishment , harsh behavior endanger the rights of the prisoners. And based on article 25 of the By-law , the head of the prisons must attend right away at any accidents in the prison and control the situation. If an accident in prison had happened , based on article 30 the officer in charge must make a report about the situation and send the report to the officials. In subsection of the article 173 its been indicated that, any beating or assault on prisoners is violation of By-Laws. The article 574 of the Islamic Punishment law says, If a prison official or guard punish the prisoners more than what was ordered will face prison from 6 months to three years imprisonment. Therefore the prison officer must prepare his report based on prisoners comments or witness comments and then send it to the judiciary officials /public prosecutor to follow the case and take action against the violators of the law and punish the perpetrators - this is the right way to let the public to know about the situation.
" Ebtekar" Newspaper is Shut Down by Media Court in Iran! According to news today Saturday Ebtekar newspaper is shut down by media court based on section 11 of the article 6 of media law. Mr. Mohammad Ali Vakili the manager of the newspaper said: I received a letter from Media Court accusing Ebtekar for "publication of lies " . It is believed that ,the paper is being shut dawn because of a title it used on its paper on Thursday. The title was : "The head of prisons was removed from his position " instead of writing , "The head of prisons was moved to another position" . Ebtekar newspaper is being shut down wrongfully because every Iranian thought , Mr. Gholamhosein Esmaeili was removed from his position because of his recent order for assault on political prisoners at ward 350 in Evin prison. But what had happened was quiet opposite and Mr. Esmaeili was promoted to new positionby Mohammad Sadegh Larijani the head of Judiciary Power. Who is going to respond to this tragic event ? 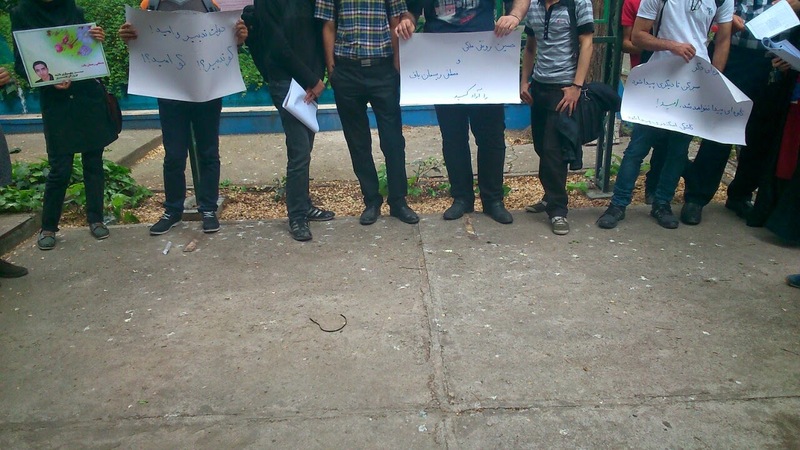 On last Tuesday students of "Elmo Sanat " University gathered in Kianoush Asa Park at the University and protested against the brutal assault on political prisoners in ward number 350 of Evin prison, among the prisoners were lawyers, journalists, bloggers, labor activists , human rights advocates and student activists. 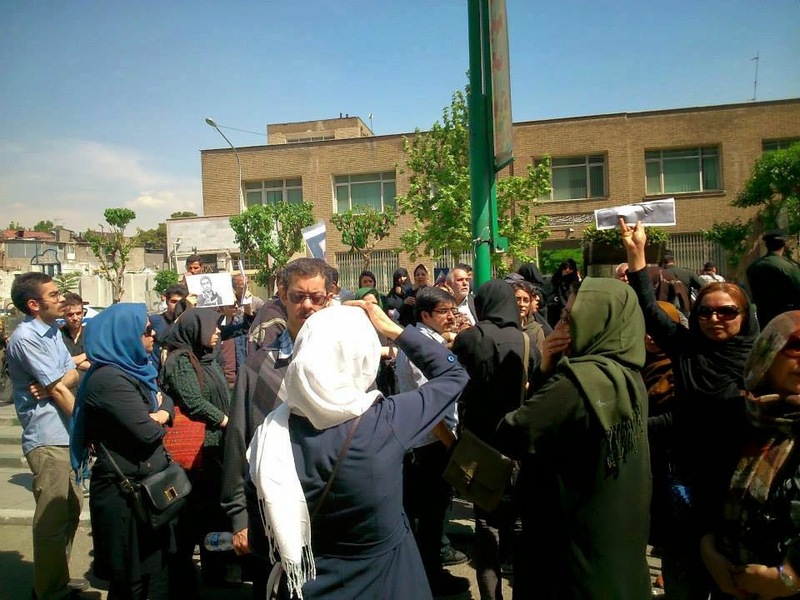 The students with a black ribbon on their wrists condemned the assault and demanded from president Rohani, the members of Parliament, the ministry of justice and the ministry of information to investigate the situation and to punish the culprits. The students held a candle light vigil for political prisoners and displayed the names of those who were injured during this brutal assault on the walls. 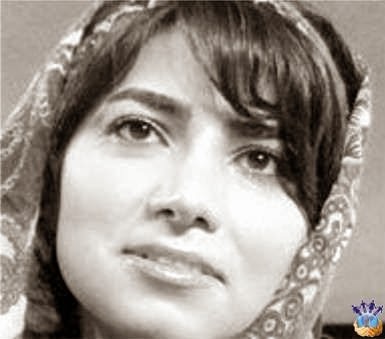 In a statement Iranian prominent poet Simin Behbehani and Jafar Panahi, Alireza Jabari, Nasrin Sotoudeh, Mohammad Maleki, Narges Mohammadi , Mohammad Nourizad , Esmail Moftizadeh and Faribourz Reisdana called for stop to her execution. The statement says: Don't wash the blood with blood. Reyhaneh is a 27 year old movie actress and her mother also is an artist . 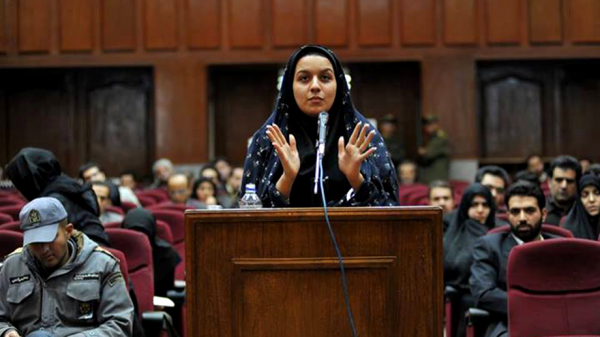 Reyhaneh have spent 7 years in jail and facing the death gallows. Thousands of Iranian in and outside Iran are involved in the case of Reyhaneh Jabar , to stop her execution. 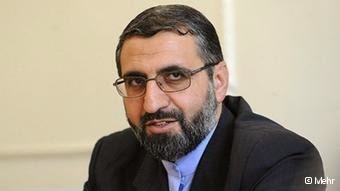 Today Mr. Gholamhosein Esmaili the head of the prison organization of the Islamic regime on Tv again lied about the hunger strike by political prisoners, Mr. Esmaili speaking with Fars news agency said , the hunger strike of the political prisoners in Evin is not true, i'm not being informed . News coming from Iran finger point Mr. Esmaili as the main culprit of the assault on political prisoners. 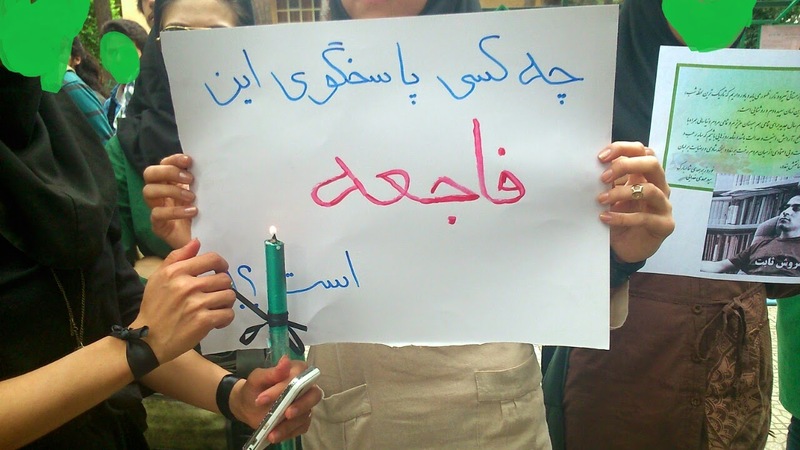 While the family members of the prisoners in a protest in front of parliament, ministry of attorney general and in front of president office were calling for Mr. Esmaeili's resignation as well as the resignation of the minister of justice , the head of the judiciary power ( Mr. Mohammad Sadegh Larijani ) promoted Mr. Esmaeili in to a new position as the attorney general of the ministry of justice in Tehran , Mr. Larijani also appointed Mr. Ali Asghar Jahangir as the new head of the prisons organization. In Islamic regime in Iran everything is possible , the more you kill the opposition ,the more you will be promoted, we have seen this kinds of promotion during Ahmadinejad's government by promoting judge Mortazavi. in last few days a wave of protest by political prisoners and their family and friends and human rights organization in and outside of Iran were organized againt the recent assault on political prisoners in ward number 350 of Evin prison. Blood can still be seen on the entrance door. 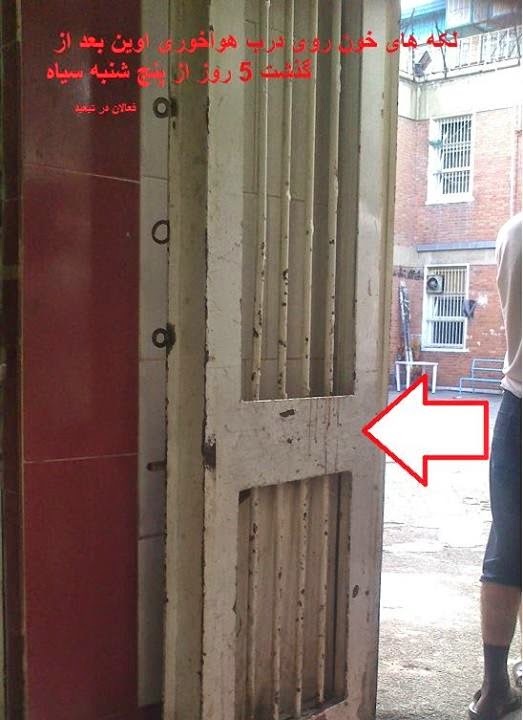 Last Thursday agents of the ministry of information , members of Sepah and more than 100 guards in an assault on political prisoners of the ward number 350 of Evin prison injured more than 30 political prisoners and transferred some of the political prisoners to solitary confinement. President Rohani's Government is under pressure from those who have voted for him to elect him as president and want him to carry a full investigation on this case and punish those responsible. Mp's are investigating to the Assault on Iranian political prisoners in Evin prison. This guy Gholamhosein Esmailzadeh head of prisons organization says nothing had happened ,while family members who have visited political prisoners say, they saw their loved ones with injuries, who is telling the truth? A few MP's including Mohammad Reza Tabesh, Pezeshkian, Mahjoub, Ali Motahari and Seyed hadi Hoseini in a petition demanded an investigation by parliament on the assault on political prisoners. Mr. Esmaeili Believes that the prisoners and their belongings are being regularly inspected but this time a few prisoners have resisted but nothing had happened. News from family members who have visited the prisoners said; they have seen prisoners with swollen faces, head or broken hands and bruises on prisoners bodies. 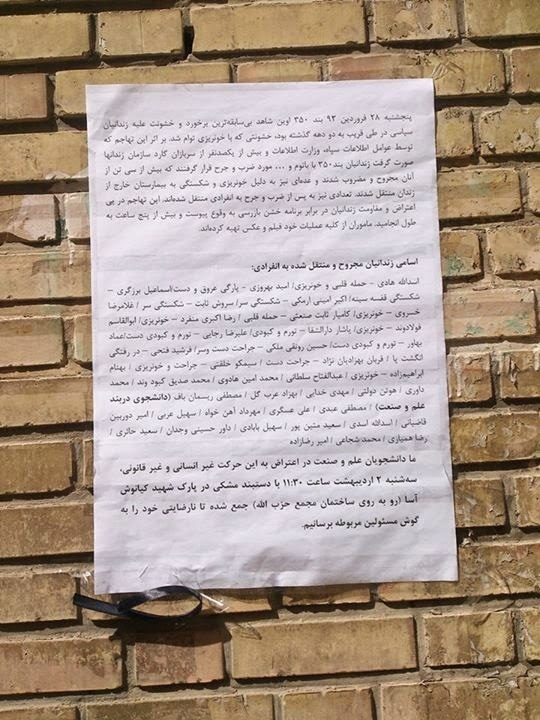 Mr. Zeibakalam a professor also wrote a letter about this situation to Mr. Javad Larijani the head of the human rights division at the judiciary power and representative of the Islamic Republic to UN on human rights. Authorities are lying, after family members visited their loved one in Evin prison ! 12 political prisoners from ward number 350 in Evin prison in protest to recent illegal assault on prisoners , violation of prisoners rights and denial of the events by the prison authorities , have started their hunger strike from noon time today Monda . 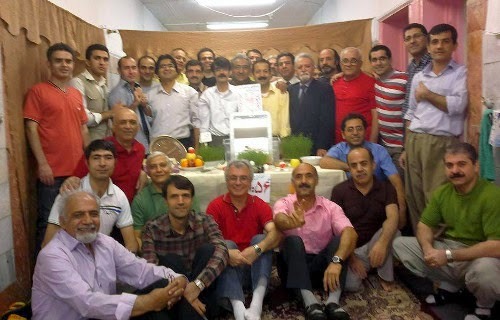 Hasan Asadi Zeidabadi, Amir Eslami, Akbar Amini Armaki, Emad Behavar, Ghorban Behzadnejad, Masoud Pedram, Amin Chalaki, Mohammad Sadegh Rabani Amlashi, Alireza Rejaei, Seyed hasan Ronaghi Maleki, Reza Shahabi and Mohsen Mirdamadi. Yesterday 28 political prisoners in a statement to President Rohani explained the assault on political prisoners on last Thursday and called it painful and horrendous and demanded it be investigated by president and national security council. These prisoners said the number of people injured in the assault are more than 30 people . 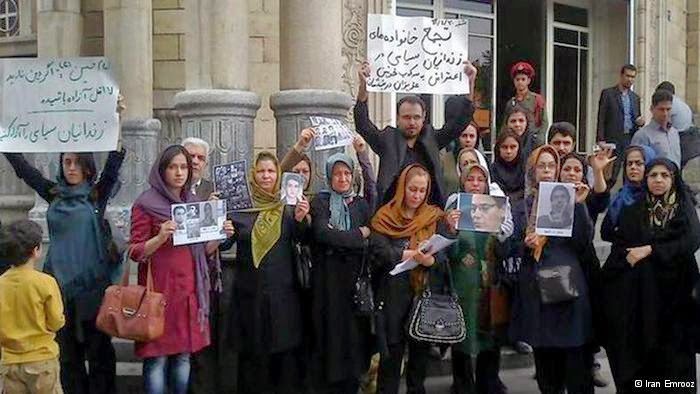 Picture shows family members outside the Evin prison. Since Thursday finally some of the family members were able to visit their loved one and with their own eyes saw the injuries their loved one endured and learnt about the lies of Mr. Pourmohammadi ( minister of Attorney General ) and Mr. Esmaeili ( Prison Authority ). The mother of Akbar Amini saw her son with broken head and neck , Mohammad Shojaei's sister saw her brother with swollen head & face and the others saw the prisoners with injuries like bruises, swollen faces and...... while leaving the prison hall way ,the family members chanted " death to dictator " and " Alah O Akbar" , family members left the hall way while crying and with anger. Akbar Amini's mom lost conscience few time after seeing her son. The family members learned that Said Matinpour was beaten and as a result he lost conscience and the prison authority transferred him to solitary confinement . Few other prisoners are also transferred to solitary confinement including Soroush Sabet, Yashar darolshafa , Asadollah Hadi and Said Haeri. According to news some family members also gathered in front of parliament to protest against this brutalities . Iranian Kurdish Lawyer Masoud Shams Nejad Faces Propaganda Charges in Iran ! Iranian-Kurdish human rights lawyer Masoud Shamsenjad is accused on "propaganda" charges and contact with foreign media”. Masoud Shams Nejad, an attorney and professor at Payam Nour and Azad universities in Orumieh, was arrested on Thursday May 9, 2013. He has defended several Iranian Kurdish political prisoners, including Ali Ahmad Soleiman, Habib Afshari, Hossein Khezri and death row inmate Habibollah Golparipour. 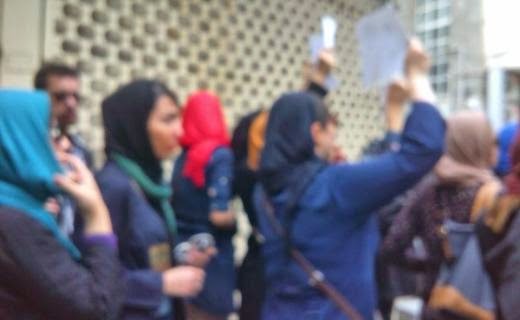 The continuing harassment and arrest of Iranian defence lawyers not only violates their rights, but those of their clients, who are finding it increasingly difficult to find legal representation because of the deterrent effect of such arrests. Today Sunday April 20 ,2014 Mother's and family members of political prisoners in ward No. 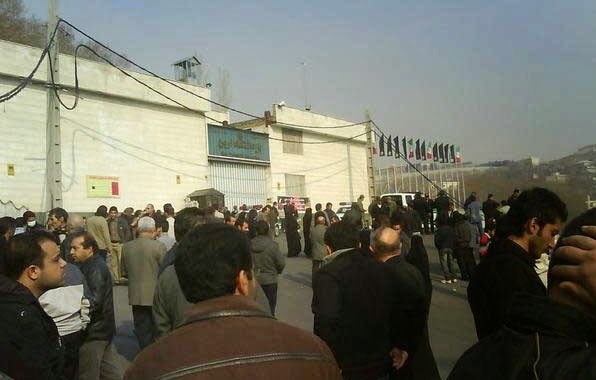 350 of Evin prison who were attacked by agents of the ministry of information , Sepah and the prison guards ,gathered in front of public prosecutors office in Tehran to protest against the recent assault on prisoners and to find out what have gone to their loved one while in prison and captivity . 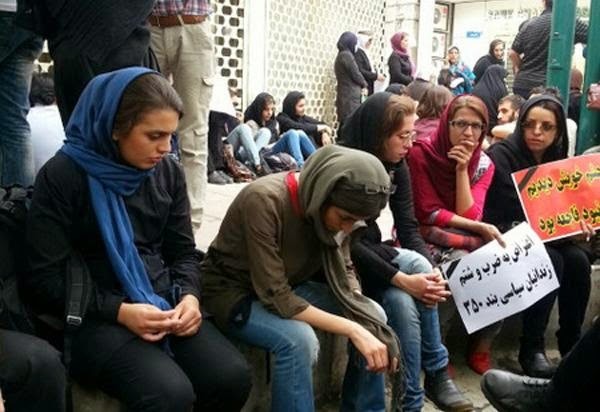 Iranian Youth, the Engine behind the Reformists and change in Iran ! Mohammad Reza Aref the early presidential nominee and a reformist visited the city of Mashhad and attended Ferdousi University in Mashhad. This picture shows how much Ferdousi university student are interested in hearing Mr. Aref's opinion and his political agendas. Mr. Aref is the president of Omid Foundation ( Hope Foundation). The Chief of Iranian Prison : I reject the Western Media News about Clashes in Evin prison between our personnel and the prisoners ! There were no clashes in ward # 350 of Evin prison ,said Mr. Gholamhosein Esmaeili the chief of Iran prisons speaking to ISNA reporter.
" I reject the news from western media about clashes between prisoners and our personnel." "We do inspect prison from time to time to collect illegal items the prisoners keep with them in prison , therefore there were no clashes , of course there were some resistance by prisoners but there were no clashes from our personnel towards the prisoners. In another news Ali Motahari an MP from Tehran said: I have also heard about this news and the chief of prison organization must answer to the situation. I don't know why these measures were taken that some were injured and some were taken to solitary confinement and the prison official must let the family members of these prisoners know about their loved ones situation .May be some elements from Ministry of information have created this situation to make problems for the new government . therefore the judiciary power , the ministry of Information and attorney General have responsibility to respond to the problem and the President Rohani must defend the rights of its citizens. We will follow this case in the parliament and the authorities must let the families of these prisoners to meet their loved ones. This Former East German , A communist and then Christian who had converted to Islam said: The Real Freedom is in Iran !!!!???? 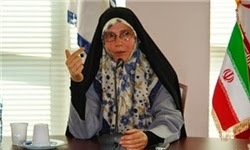 Ms. Veronika , an east German , a former Communist who became a christian faith believer but who have then converted to Islam recently and currently live in the city of Rasht in Iran , in speaking with Fars News reporter said; The Real Freedom is in Iran!!!!????? In Iran the whole truth is being told to human and they are trained by that. In Europe there are no kindness and spirituality. Ms. Veronika's new name is Maryam Fazeli and in a prayer in the city of Rasht she asked the Iranian women to read the 12th Imam prayer for his return. When someone says ,she is "more catholic than pope" is the story of this woman, she is now more Iranian than Iranian themselves, what a colorful woman!!!! 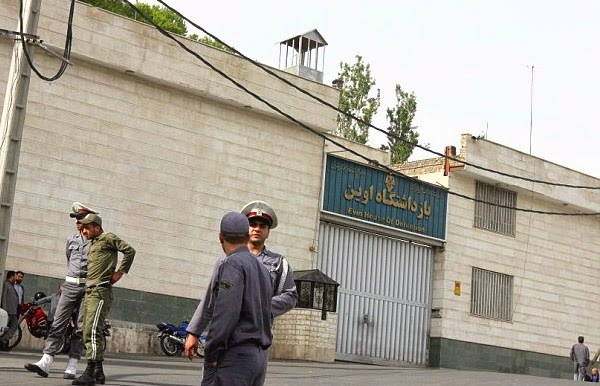 On Thursday Prison Guards together with Sepah Agents and agents from Ministry of Information attacked on political prisoners in ward 350 of Evin prison ,as a result 30 political prisoners were wounded and more than 30 were blindfolded and then transferred to an unknown location. Political prisoners in Evin at present are on hunger strike and the reason for hunger strike is that, they want to know what happened to those who were transferred? A witness to this attack said, those who attacked political prisoners were with plain cloths , some of them were interrogators and some were the guards , it seemed they have organized this attack , they had camera installed in different location in the prison to record prisoners reaction to the attack, they have said ,it was for inspection of prisoners belonging but they had another plan, they have beaten prisoners , as a result Mr. Omid Behrouzi had bleeding due to a cut on his blood arteries , Akbar Amini had cut on his head, Masoud Arab had broken shoulder, Esmail Barzegary had his ribs broken Farshid Fathi had broken leg and Mr. Rejaei also was wounded due to beating. Reports of prison guards raiding Section 350 of Tehran’s Evin Prison, where many political prisoners are held, have emerged raising fears about the safety of prisoners. The unrest appears to have resulted in prisoners sustaining injuries, including broken ribs. It has been reported that at least 32 individuals from Section 350 have been transferred to solitary confinement in Section 240 of the prison. 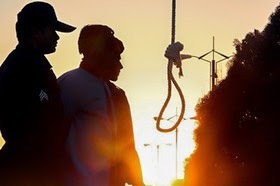 According to a report by Kurdistan Human Rights Watch , Samkou Khorshidi an Iranian Kurdish political prisoner is executed on Thursdayin Dizel Abad prison in the city of Kermanshah. Mr. Khorshidi's was charged with membership to a Kurdish political organization and armed struggle with Islamic regime in Iran. Mr. Khorshidi was arrested in 2011 by security forces around a highways in Tehran. It was said, during his arrest ,the security forces used their gun and wounded Mr. Khorshidi . Up until know the family members of Samkou Khorshidi did not receive his body for burial. Press TV in the past reported the confession of this political prisoner. 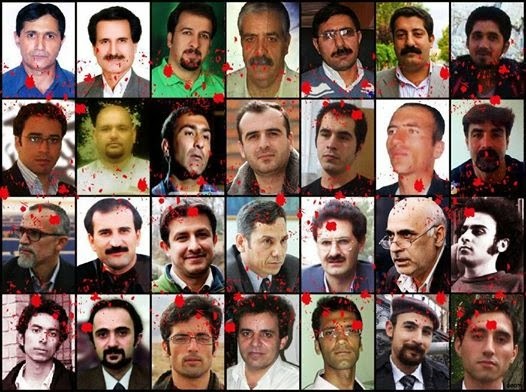 In the past Islamic regime have executed several Kurdish political prisoners including: Shirkou Maarefi, Habibullah Golparipour, Reza Esmaeili, Farzad Kamangar, Ali Heydarian, Farhad Vakili, Mehdi Eslamian and Shirin Alamhouly. A former soccer player from Mazanderan province pardoned his son's killer and saved the killer from the gallows. Mr. Abdolghani Hoseinzadeh's son was killed during a fight and the killer was about to be executed in early morning by way of " Ghesas" an Islamic Sharia law ,but at last moment while the the killer was on the gallows and the rope was in his neck , Mr. Hoseinzadeh ( victims dad ) himself went to the gallows and removed the rope from killers neck and saved his life. 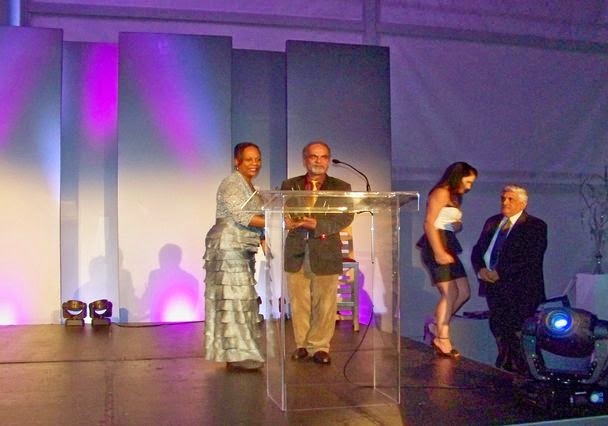 Iranian journalist Mashallah Shamsolvaezin receives the 2014 World Press Freedom Hero Award from Alison Bethel McKenzie, IPI’s executive director, at the IPI World Congress in Cape Town on April 14. CAPE TOWN, April 15, 2014 – Iranian journalist Mashallah Shamsolvaezin, the International Press Institute’s newest World Press Freedom Hero, called publicly on his country’s government to unconditionally release the 48 journalists it holds behind bars. Shamsolvaezin said that his research and monitoring of developments in Iran showed that 48 journalists are imprisoned, which would make the country the leading jailer of journalists in the world, surpassing Turkey. Some 44 journalists are behind bars in Turkey, local sources say, following releases of a number held in connection with alleged coup plots. That tally is a drop from a high in Turkey of more than 100 journalists who were in prison in 2012. Thanking IPI for the award, Shamsolvaezin also urged the Iranian government "to release and unfreeze the block” on the Association of Iranian Journalists, which he headed until authorities shut it down in 2009. 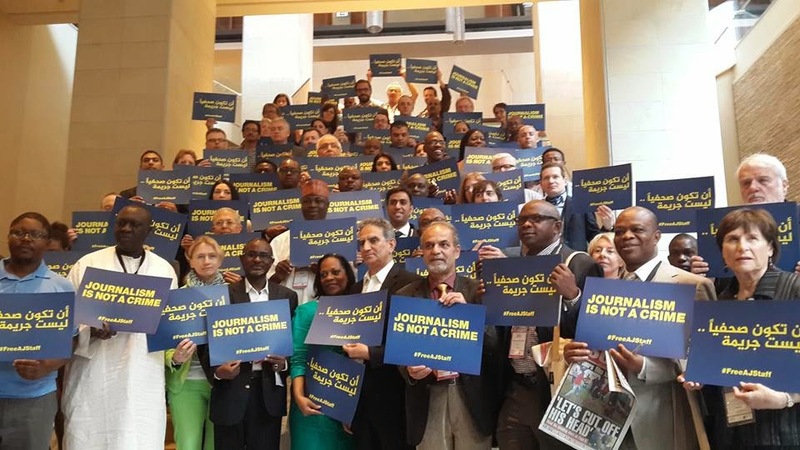 That request echoed a call by Palestinian journalist and IPI Executive Board Member Daoud Kuttab earlier in the day, urging IPI members at their General Assembly to call on Iran’s government to drop its ban on the association. Shamsolvaezin is a former editor, and in some cases founder, of four reformist dailies shut down by Iran’s authorities. He has been jailed numerous times for his criticism of government policies and he served 17 months in Tehran’s notorious Evin Prison from 2000 to 2001 in connection with an article that he wrote criticising capital punishment, which was deemed insulting to Islamic principles. Speaking via interpretation provided by Kuttab, Shamsolvaezin told Congress participants that journalists in Iran experience only three of the four seasons. IPI’s World Press Freedom Hero Award honours individuals who have made a significant contribution to press freedom, often at significant risk of attack or imprisonment. IPI yesterday also honoured Al-Monitor as the recipient of IPI’s 2014 Free Media Pioneer Award. The media organisation provides original reporting and analysis by prominent journalists and experts from the Middle East, and offers an in-depth focus on Egypt, the Gulf, Iran, Iraq, Israel, Lebanon, Palestine, Syria and Turkey. Branding itself "the pulse of the Middle East," Al-Monitor covers news and trends in partnership with nearly two dozen regional publications. It publishes content both in English and its original language - Arabic, Hebrew, Persian and Turkish. Given annually, IPI’s Free Media Pioneer Award was established in 1996 to honour media or organisations that have fought to ensure freer and more independent media in their country. IPI last night’s ceremony with the presentation of the 2014 International Human Rights Book Award to South African journalist Hugh Lewin for Stones Against the Mirror: Friendship in the time of the South African Struggle. The book details Lewin’s experience in South Africa’s anti-apartheid struggle, including the seven years he spent behind bars as a political prisoner and his journey towards reconciliation with the former comrade who betrayed him to security police. Recipients of the book award are chosen by an international panel of journalists and media experts under the chairmanship of Johann P. Fritz, a former director of IPI. VIENNA, Jan. 31, 2014 – The International Press Institute (IPI) today announced that Iranian journalist Mashallah Shamsolvaezin has been named the IPI World Press Freedom Hero. Shamsolvaezin is the former editor, and in some cases founder, of four reformist dailies, Kayhan, Jame'eh (laterTous), Neshat, and Asr-e Azadegan, which were all successively shut down by Iran’s authorities. He was jailed numerous times for his criticism of government policies, the longest detention period being the 17 months he spent in Iran’s notorious Evin Prison in 2000-2001 in connection with an article criticizing capital punishment that was deemed insulting to Islamic principles. 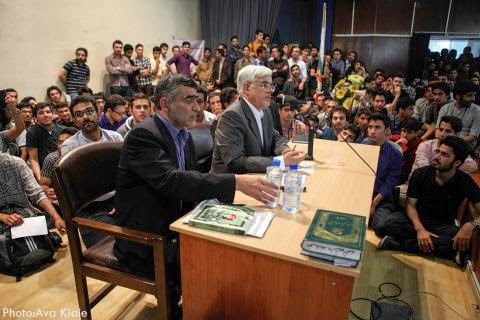 Shamsolvaezin serves as spokesman for the Iranian Committee for the Defense of Freedom of the Press and as vice president of the, now-defunct, Association of Iranian Journalists. A former recipient of CPJ’s 2000 International Press Freedom award for courage and independence in reporting the news, Shamsolvaezin just last month criticized the Iranian government for failing to protect press freedom, telling the Iranian Labour News Agency (ILNA): "In the past and under the former administration, the Ministry of Guidance’s press branch would accept media community members with open arms. 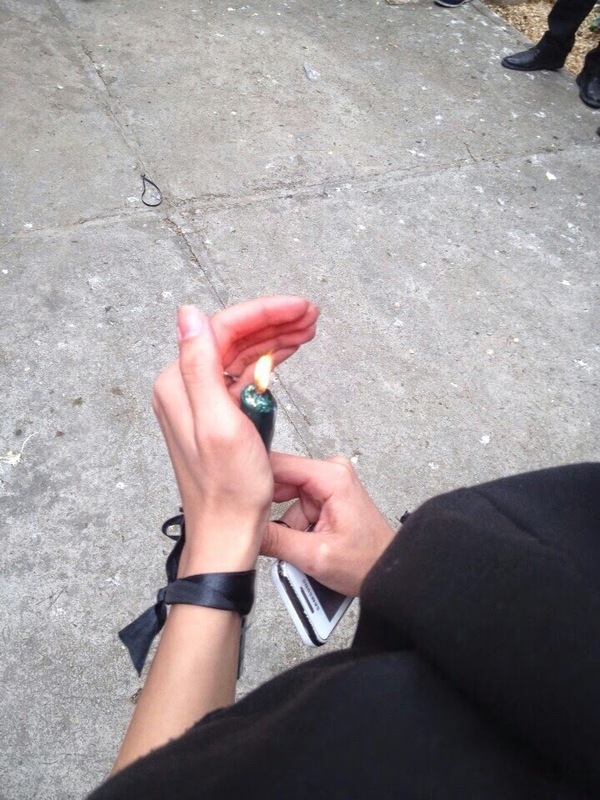 They would talk with them, but it would all end up with no result." The Rohani government, he told ILNA, is operating in exactly the same manner. Mashallah Shamsolvaezin will become the International Press Institute's (IPI) 66th journalist to receive the World Press Freedom Hero honor. 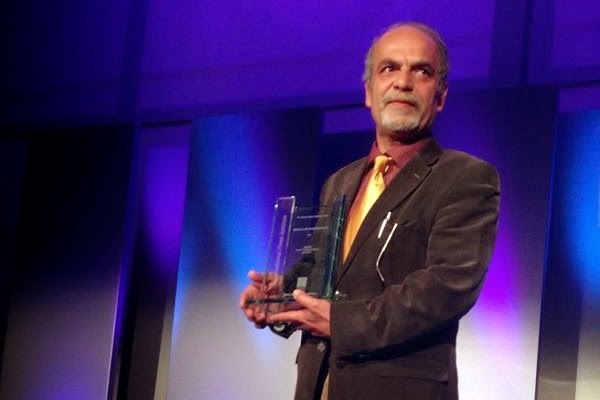 He is the third Iranian journalist to receive the award, the others being Akbar Ganji and Faraj Sarkohi. Other recipients of the award include Katherine Graham, former publisher of The Washington Post; investigative journalist David Stephenson Rohde; Russian journalist Anna Politkovskaya; Percy Qoboza, of South Africa; Doàn Viét Hoat of Vietnam;Veronica Guerin, of Ireland; and Sir Harold Evans. Shamsolvaezin was selected for the honor by a seven-member jury consisting of senior media executives from Liberia, the United States, Zambia, Poland, Japan, Jordan and Austria. 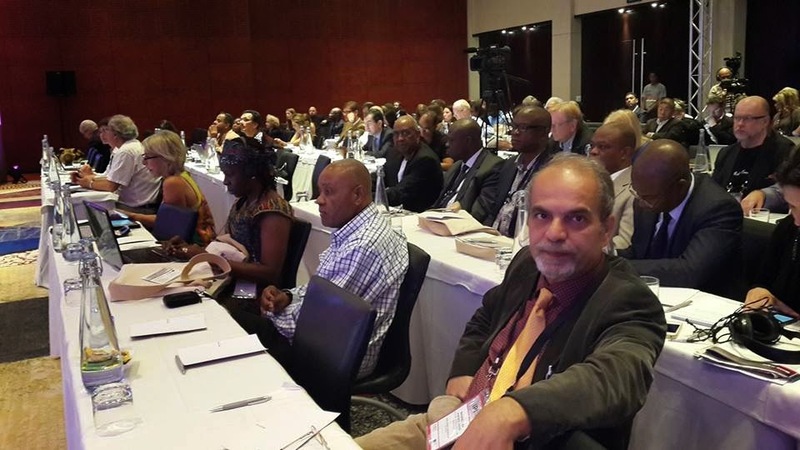 Shamsolvaezin will be presented with the award at IPI's annual World Congress, which will be held on April 12-15, 2014 in Cape Town, South Africa. For more information on the Congress, go to www.ipiworldcongress.com or email mmiletic[@]freemedia.at.